Imagine your holiday table set with these elegant napkins or gift them to the wonderful person who invites you to dinner. 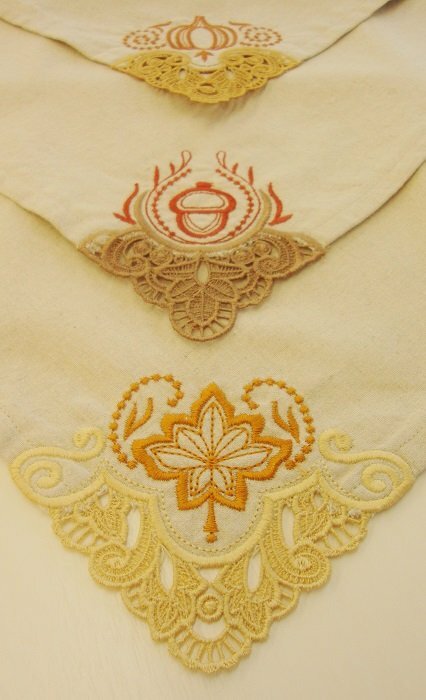 The lace gives the impression that you worked for hours, but they are easy to make with your embroidery module. You will also learn how to make mitered napkins and how to add other designs to your napkins. Great items for any table or any holiday. Hi, I’m Carol Gries and I look forward to working with you on sewing these lovely and useful table napkins. In addition to adding cut lace to the project, you will also learn how to make napkins with mitered edges and how to add a graphic design to the corner so that you can create all kinds of napkins. Embroidery bobbin case. Larger Berninas have only one case. OESD AquaMesh Stablizer (enough for three hoopings) I use this for all my cut lace work. ***OESD Design file #12722 Autumn Napkin Corners*** The enclosed sheet provides instructions on obtaining the design and uploading it to a flash drive. You must bring this flash drive with you. There are many places to find embroidery designs. Your embroidery module has some designs and alphabets already loaded. This is a great place to start. You can purchase CD’s with designs or may own other software that contain designs. A great place to go for designs is the internet. These directions will guide you through obtaining designs from my favorite site, Embroidery Design Studios. The designs are always clear and sharp and the stitch count is great. I have never been disappointed. It is the first place I go when I want something. 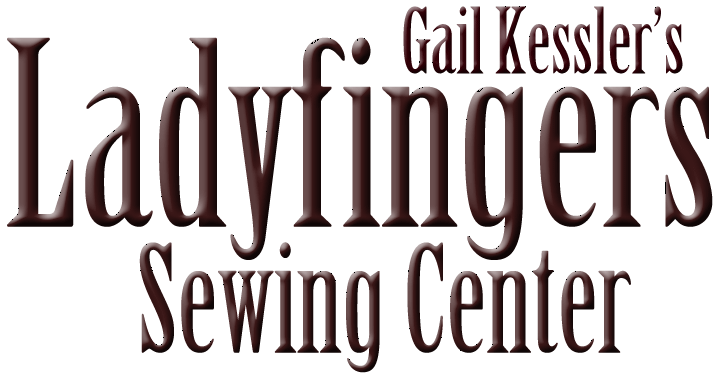 Go to http://ladyfingerssewing.com/ which is Ladyfingers Home page. Scroll down until you see “Embroidery Online” which is under Gail’s picture and click the site. You’re now at Embroidery Design Studio. Take some time and look around. Create an account by clicking “Register” at the top right of the page. Follow the prompts. Look around and see what you like. If you already know the number of the design you want, enter it in the search box. If the design is for a Ladyfingers Class, the design number will be on your supply list. If the design is part of a collection and you don’t see the picture scroll down the “all” button and you will see other choices. To check out, click on the little shopping cart at the top of the screen. Proceed through Checkout procedure by following prompts. When your order is complete you will get a page that says “You can download your designs by clicking here” Do that. This is “My Designs” page. It shows everything you have purchased. You can also access this page anytime from the home page. “X” out of the design info page and on the “My Design” page select the format for your machine and then click “download”. If you chose the EXP format for Bernina, it will download as a ZIP file. Save the file to your computer. It will save to your “download” folder. It uses the file name of the number you have on the design info you printed out. To open a ZIP file: Right click on the file icon and open with either windows explorer or Win Zip. If you own Win Zip, you know what you’re doing. If you use Windows Explorer you will see one or more files. I copy these files in one folder and save it in documents with a name I’ll recognize. Remember that EXP files are not visible on your computer unless you have Bernina editing software. Otherwise you must copy them to a flash drive to view and use on your sewing machine. And… you’re ready to go. It seems like a lot, but the whole process from the time you purchase until you are ready to sew takes about 2 minutes.